For any person getting ready to learn a new language, their headphones could be their most important tool. With listening being a key component to learning a language, you could end up spending hundreds of hours with a set of headphones attached to your ears. So do yourself and favor and before starting any language, ensure you have the best headphones for learning a language. What Plays into making Headphones Good for Language Learning? When looking for the best headphones for learning a language, you should focus on three categories: Sound, Comfort, and Durability. For sound it is important you find a set that not only has a good tonal range but is specifically designed with a high treble. Don’t get caught in searching for a top-notch base. While good with music, the base can actually dilute the spoken words and make it harder for you. Sound: When it comes to learning a language, going for something with a lot of base is counterproductive. Instead, you need to focus on range and treble or else otherwise you're losing out of the intricacies of voice. Comfort: Most people believe that noise canceling headphones are key, however, when it comes to comfort, this is not true. While having the ability to nullify all external noises, the positive pressure created by the noise canceling headphones can actually become uncomfortable when listening for over an hour. Durability: When it comes to durability, there are certain aspects you can look for. Headphones that have metal components instead of plastic will always hold up better. Furthermore, those with cords made of nylon instead of just a rubber will not only make them more durable but will reduce knotting which can cause kinks and degradation in sound quality. 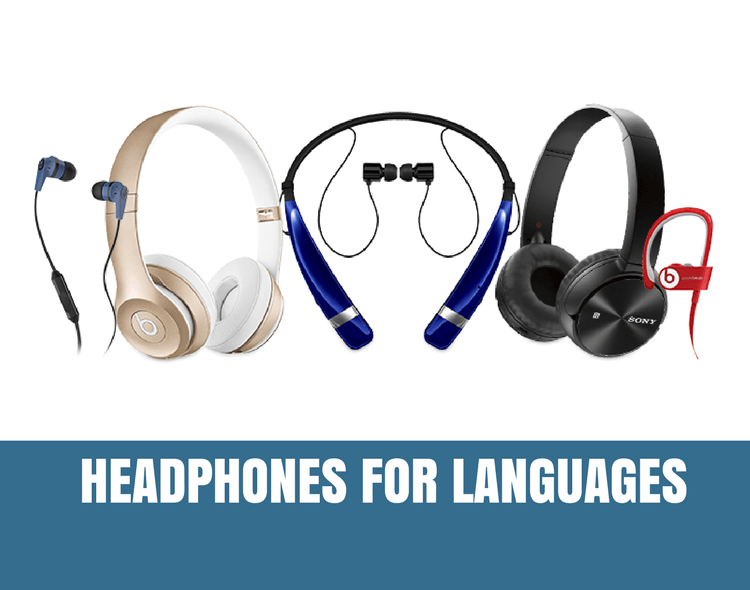 With these three aspects in mind, we have put together a list of the top three headphones for learning a language. Since many people have different types of comfort levels, we have chosen an over-ear set, in-ear set, and on-ear set. We have also selected a wide range in prices since most people’s budgets aren’t the same. Below is a chart listing the top three headphones for learning a language. Remember, it's very important that the treble has a good range and the base not be too overpowering when trying to pick up the important nuances in tones. So, to help you, here are the three best in the different categories of headphones. Then below that, you can find more on each one and learn why they made our list. These V-Moda’s are the best in the market. They are fully integrated with top-notch materials to include extra nylon wires, 8mm jack, and case. With this set, you will never have a tangle in the wire thanks to the extra-reinforced nylon wiring system. Furthermore, you cannot beat their sounds. In comparison to the top Bose on the market, these have a deeper and smoother range and are more than half the price. Also V-Moda has a lifetime guarantee on their products, making people, like me, lifers! If the V-Moda’s didn’t float your boat, then the Klipsch will. Not as durable as the V-Moda’s but do contain a durable extra thick matte polymer casing that isn't prone to breaking like the Beats by Dre do. Comes with an extra set of jacks and a case, but no extra cord. The range is above average with exceptional treble. When it comes to headphones, I am not normally a Monster fan. However, the Monster DNA’s meet all the requirements set forth in this article. Their extra-thick wiring makes them harder to tangle then most. Their sound quality is impeccable, especially in the base range. With 6 different in-ear inserts, you will have no problem finding comfort for your ear canals. A must own for those audiophiles out there. So remember, when looking for headphones for learning a new language, ensure you look for comfort, durability, and high treble. While we only highlighted three on this post, there is much more on the market. Amazon.com is a great source and has just about every set on the market. You really can’t go wrong. If however, you are like me, you can go to the Apple store or a Best Buy and test out the headphones yourself. Happy hunting!